Is the societal change that Germany now faces tantamount to die zweite Wende, or ‘second turning point’? 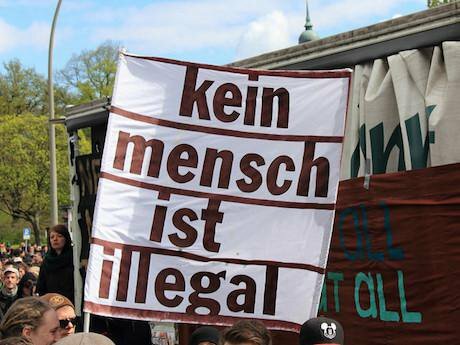 May Day demonstration in Hamburg "Never mind the papers". Rasande Tyskar/Flickr. Some rights reserved. 800,000 is the much-cited number of refugees that Germany can expect to receive this year. Chancellor Angela Merkel has clearly recognised that such an unprecedented influx will fundamentally change Germany and Vice-Chancellor Sigmar Gabriel further surmises that Germany may well receive over 500,000 people per year over the course of the next few years. This, he admits, will be the country’s biggest challenge since die Wende: the most common term for the ‘change’ or ‘turning point’ in German society following the fall of the Berlin Wall and German reunification. Is the societal change that Germany now faces tantamount to die zweite Wende, or ‘second turning point’? A recent New York Times cartoon suggests as much, depicting ‘the fall of the wall all over again’ with Merkel and jubilant Germans welcoming refugees through a demolished wall between the global North and South. If the current inflow of people represents a social transformation of proportion similar to German reunification, what might such change entail? Following the reunification of Germany, necessarily far-reaching political, economic and social restructuring ensued. Twenty-five years after German reunification, however, the process is still not complete: the former East and West regions of Germany still significantly diverge socio-economically and in terms of public attitudes. Transformations following from the current, large-scale immigration will also be far-reaching and will take decades to unfold. It will also likely have highly divergent outcomes across German society. Gabriel’s conjecture of large-scale immigration over the foreseeable future is likely correct. One thing we know from migration theory is that new migration leads to more migration. As people move across borders, the expansion of transnational social networks – now augmented by smart phone technology – facilitates information sharing to would-be migrants about modes and routes of travel, job seeking, acquisition of housing and so on. Furthermore, the causes of present-day migration are not going away. These are multiple, interwoven and compounded. They include political, social, economic, demographic and environmental causes. The constellation of compound migration causes in every country or locality from whence ‘refugee crisis’ newcomers to Germany currently originate is wholly different, and none will be ameliorated in the near future. Over the past 50 years in Germany, there have been successive waves of new migration and diversification. From the 1950s to the early 1970s, newcomers were comprised largely of Italians, Yugoslavs and Turks who shared the status of ‘guest workers’ and family reunification during the 1980s and 1990s saw an expansion of these national groups. Since the 1990s – when there was also a massive inflow of refugees from war-torn Yugoslavia – Germany has been witness to a changing demographic in those travelling to it from countries across the globe. This has amounted to a considerable diversification of immigrant populations. Over the past twenty years, in Germany (as elsewhere around the world), a new migrant diversity has been layered on top of an earlier one. These waves have, on the whole, been experienced favourably in Germany. This is shown in the annual ‘Integrationbarometer’ compiled by the Expert Council of German Foundations on Migration and Integration, which depicts a generally pragmatic and positive attitude towards issues of migration and integration amongst Germans and migrants alike. Furthermore, at the Max Planck Institute for the Study of Religious and Ethnic Diversity, multi-disciplinary research across 50 neighbourhoods in 16 German cities demonstrates surprisingly high levels of contact between Germans and people with migration backgrounds; the contact notably tends to be valued positively by all. Now, with the inflows in 2015, an even newer diversity is being layered upon an already varied population in Germany. Syrians, Afghans, Pakistanis, Eritreans, Somalis, Nigerians, Sudanese and Iraqis make up a large proportion of today’s arrivals, along with continued high numbers of people from Serbia, Kosovo and Albania. They come at the same time as the continued migration from the EU of others, especially from Spain, Portugal, Italy, Greece, Poland and Bulgaria. Yet it is not enlarging ethnic or national diversity that will pose the biggest challenges for German society. Rather, it is likely that the biggest challenges will surround the differing legal statuses of newcomers. Like most Western democracies, Germany sorts and deals with new arrivals by way of differential migration channels, tracts and legal statuses. For example, there are EU migrants, temporary or seasonal workers, high skilled and corporate migrants, asylum seekers, officially recognised refugees, people with temporary residence permits or temporary suspension of deportation (Duldung), arrivals through family reunification, students, failed asylum seekers, people with lapsed visas and undocumented migrants. Each status entails different opportunities, restrictions and consequences. These include issues concerning: permission to work; employment conditions and wages; length and nature of residence; prospects of family reunification; access to welfare, health, education, public services; legal representation; chances for permanent settlement and eventual possibility of gaining citizenship. A variety of research findings demonstrate how migration status has implications for individuals’ earnings, health outcomes, housing, social network formation, neighbourhood life and family dynamics. Undocumented persons and failed asylum seekers – of which there will be many in Germany – have an exceedingly hard time, especially in a country highly dominated by red tape. Their direct socio-economic impacts mean that their legal status outcomes are often intrinsically related to creating or perpetuating modes of inequality. Directly arising from legal status, some people are able to do things, get things, be more socially mobile or simply live in different ways than others. Social transformation in the future? As with the previous waves, cordial if not positive encounters are likely to be commonplace. Language will be a key frustration point, yet more and more Germans will learn to find a communicative middle ground with those who have less than fully competent German language skills. There will be difficulties but eventual accommodation will be reached as newcomers infringe – then learn – the ordinary, small and habituated proprieties, phrases, gestures, do’s and don’ts that Germans have internalised. Across the country, practices of uneventful, everyday living together will go largely unnoticed. At the same time, there will doubtless be problems aplenty, in some places more than others. Local resources and institutions – schools, healthcare institutions, housing, and social services – will be considerably challenged for a long time. Occasionally social tensions will flare. Ugly incidents involving racist reactions will occur intermittently, but in isolation. Movements of the far right will probably not expand much beyond their current size (which is not very extensive, and is also geographically patchy). Politicians of the right will, however, leap on any chance – such as an incident of serious crime involving a migrant – to bark ‘I told you so’. Indeed, the migration blame game will be played, exacerbated and used repetitively for an array of purposes. Through processes of stereotyping, in many people’s eyes certain national groups will be positively valued while others are stigmatised. The problems, stigmas and social stratification that arise around new migration will, however, have far less to do with ethnicity and culture than with migrants’ legal statuses. These will give rise to socio-economic structures crosscutting nationality and ethnicity among people with migration backgrounds. The overall future picture is of a very uneven social landscape. Across Germany there will be more and less successful examples of ‘integration’ (a word asked to do far too much work, since it can mean very different things when used in relation to education, the labour market, social relations, cultural values and language acquisition). Obviously, the ongoing task for politicians, the media and academics will be to define, identify and understand – in different places around Germany – the complex set of factors, processes, practices, institutions and resources that contribute to what counts as more or less success. Today it is conventional in Germany to use the phrase ‘since the turning point’ (seit der Wende) to refer to any substantial post-reunification development. The social transformations facing Germany will be of such an order that, in the future, ‘since the refugee crisis’ (‘seit der Flüchtlingskrise’) might be as familiar a phrase.